Confession: I'm the girl in the froyo line that swipes all the mochi toppings. There's just something about that bouncy marshmallow texture that I can't resist. If you're unfamiliar, mochi is a Japanese rice confection that's slightly sweet and chewy. You can eat it plain or chopped into pieces for a sundae topping. It is often filled with sweet red bean paste, but I love eating it wrapped around strawberries and scoops of ice cream. I didn't intend to make mochi yesterday, but around lunch time I had a craving for it. I decided to make myself some with a 'cheat' version that's made in the microwave (mochi purists - look away!). First, you stir all the ingredients together and microwave it at 100% for about 3 minutes. When it comes out of the microwave it looks like this (above) - almost solidified with a runny center. Then you stir, stir, stir the sticky mass together and heat it again for another 2.5 to 3 minutes. Ta-dah! Mochi! Well, almost. It's rather hot and sticky at this stage, so be very careful handling it. Let it stand for a minute or two and then dust with cornstarch. Pat out the mochi out with your hands as well as you can. It will be elastic and prone to spring back. You can use a corn starch-dusted rolling pin to flatten the candy. Cut the mochi into pieces with a sharp knife. Dust the knife with flour if it wants to stick to the candy. 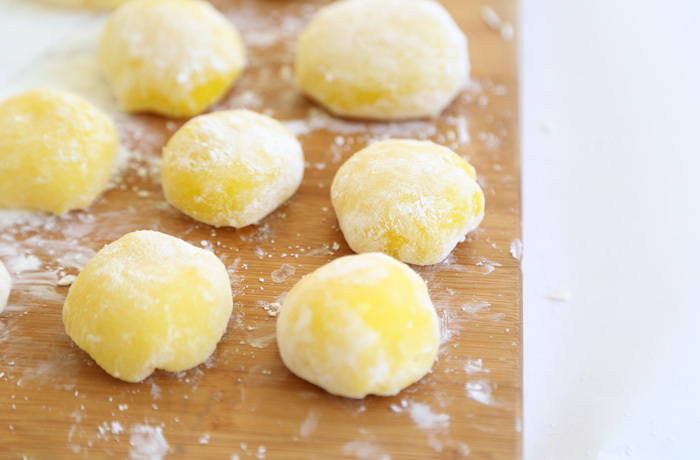 Pinch the ends of the mochi together to form a little round dumpling-shaped piece of candy. You'll have to gather and pinch (rather firmly!) repeatedly to achieve the round shape. It's okay if the end result isn't perfectly round. See? Mine are far from perfect rounds, but the candies will look more perfect after they are placed in mini cupcake liners. The excess cornstarch can be brushed away with a pastry brush or a small soft hair artists' brush (make sure the latter is new, unused or kitchen-dedicated). The beaks are candy-coated orange mini chocolate chips (you can find them here) and were attached with a teeny-tiny drop of light corn syrup, as were the black sugar pearl eyes (found here). The feet are orange flower sprinkles (here). Mochi is very soft and holds moisture, so over time the black nonpariels will start to melt. My batch didn't last long at all, so this wasn't a problem for me. If you're looking to store these for an extended amount of time, I'd suggest piping black buttercream on for the eyes instead of using the nonpareils. The other sprinkles fared much better. 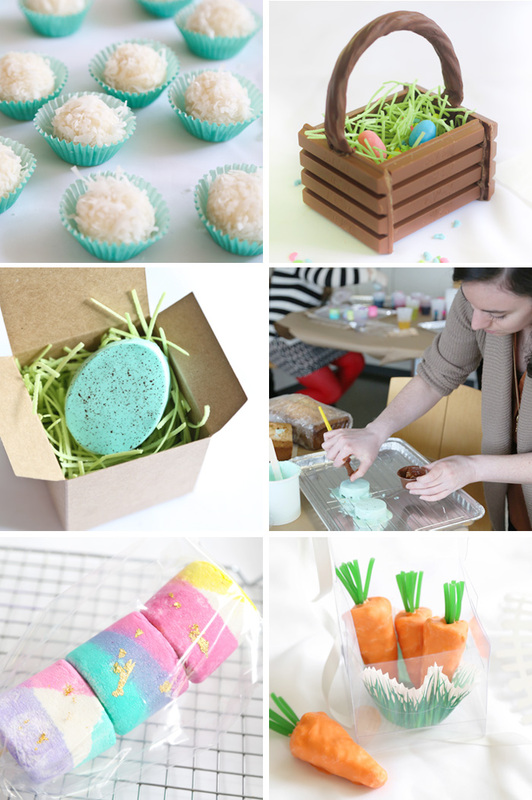 Before I close there's something else I'd like to share with you - more EASY Easter treats! I recently held a workshop for the blog editors at HGTV, which was really awesome and kind of surreal for me. I can't believe I didn't get pictures of their gorgeous lobby and stylish cafe, but trust me when I say -wow. Anyway. You can check out our workshop here on HGTV.com, and there's links to all the recipes we made that day. So fun! 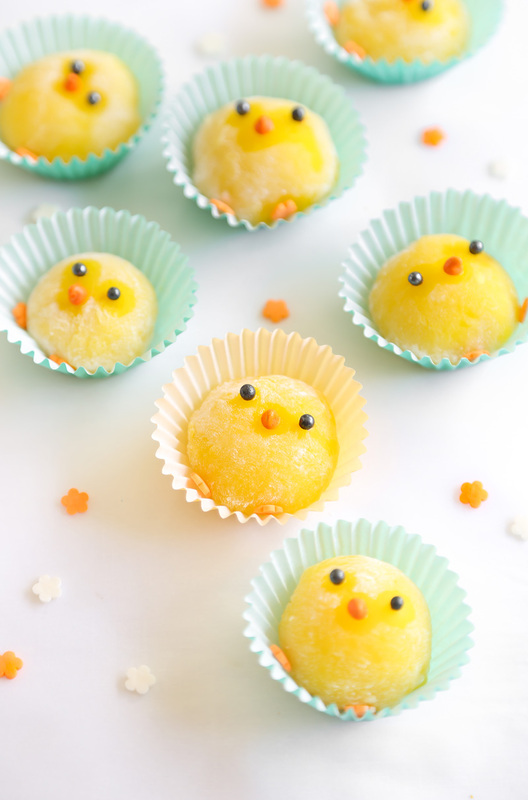 One more little note about these mochi chickies, you must use a special kind of rice flour called Mochiko, or, glutinous rice flour. This flour is available at international markets and online. If it doesn't say Mochiko or glutinous rice flour on the package, don't use it for mochi! Combine all of the ingredients except the cornstarch in a medium size microwave safe bowl. 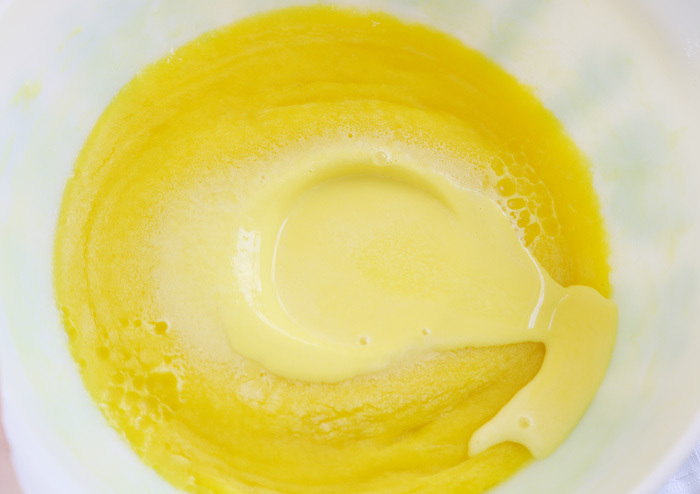 Using a rubber spatula, stir the mixture well until no lumps remain. Scrape away any excess liquid mochi mixture that may have been sloshed high on the sides of the bowl while stirring. Microwave the mixture at 100% power for 2 minutes. Remove from the microwave and stir well. Dough will very thick and sticky, just stir as best you can with a sturdy spatula. Return to microwave; heat for 2 minutes longer. When dough begins to inflate while cooking, and then deflates with the microwave door is opened the candy is ready to be removed. 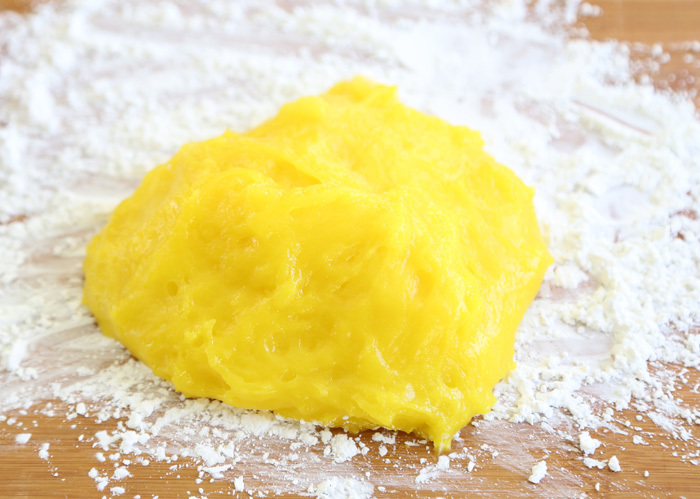 If the dough doesn’t inflate during the previous one minute of cooking time, microwave for 1 additional minute. Remove the bowl from the microwave. 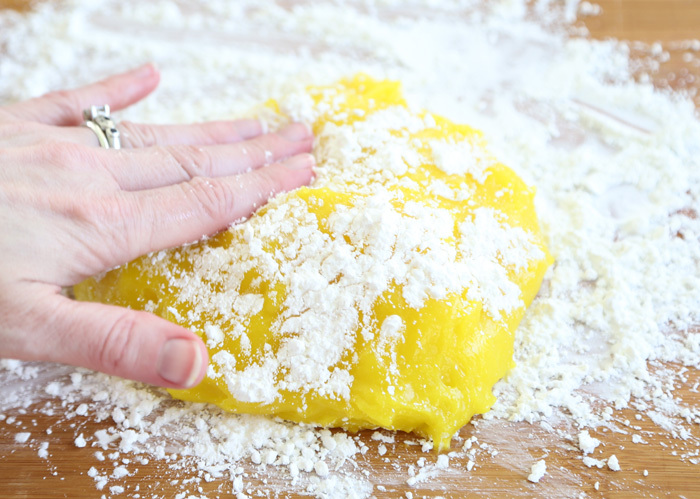 Sprinkle a cutting board with half the cornstarch; scrape the hot dough onto the cornstarch and then pat the surface with cornstarch-coated hands (be careful, the dough is sticky and HOT!). 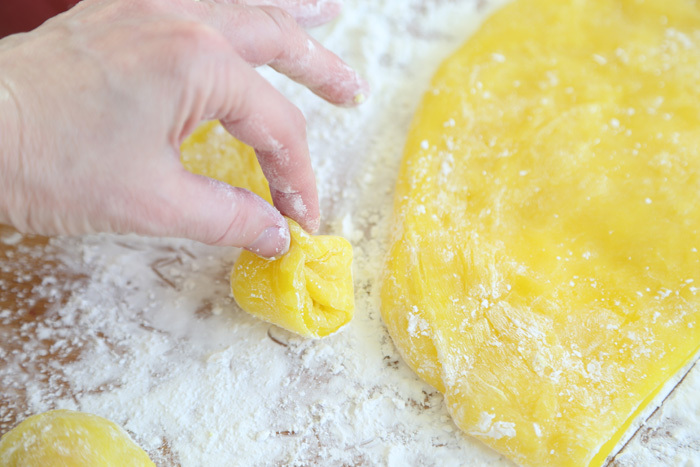 Stretch dough gently and use your hands to flatten it. Cut into 10-12 pieces. 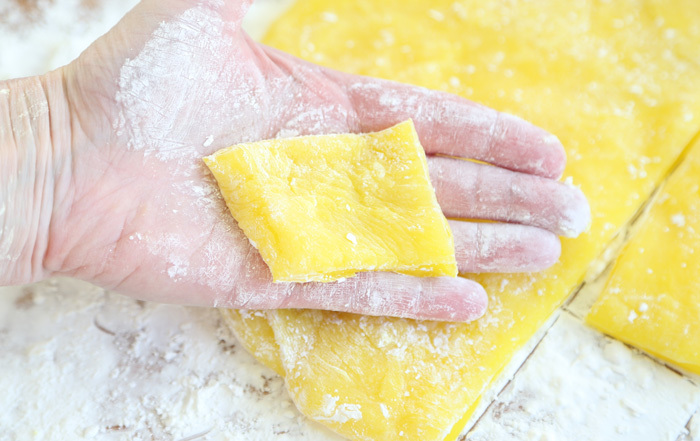 With corn flour-dusted hands, gently pinch the edges together to form a ball. Place each ball into a mini cupcake liner and brush away excess corn starch with a pastry brush. Adhere the black nonpareils or ‘eyes’ onto the mochi with dots of corn syrup, adhere the mini chips (beak) and flower sprinkles (feet) in the same way. Note: I think these are best eaten the same day, but they can be kept fresh with plastic wrap and refrigeration. I'm that person too - the one swiping all of the mochi topping in the froyo line! I love it. Have you tried the mochi ice cream from Trader Joe's? Soooo good! 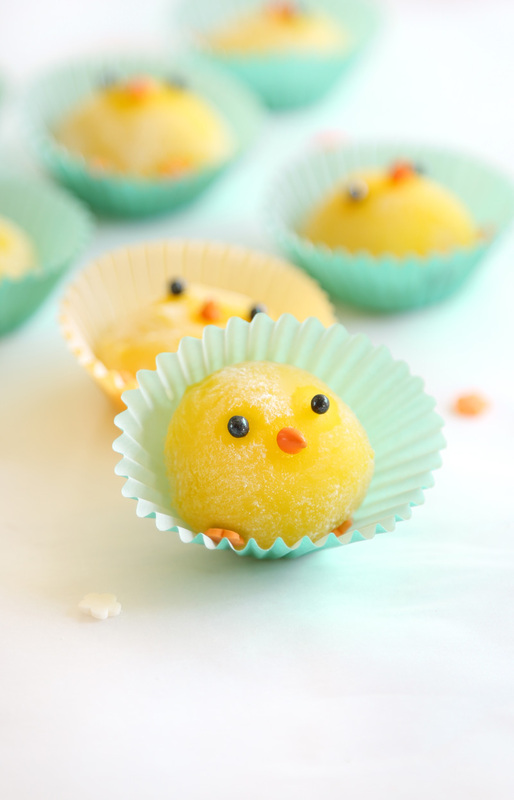 But these just look downright too cute to eat! 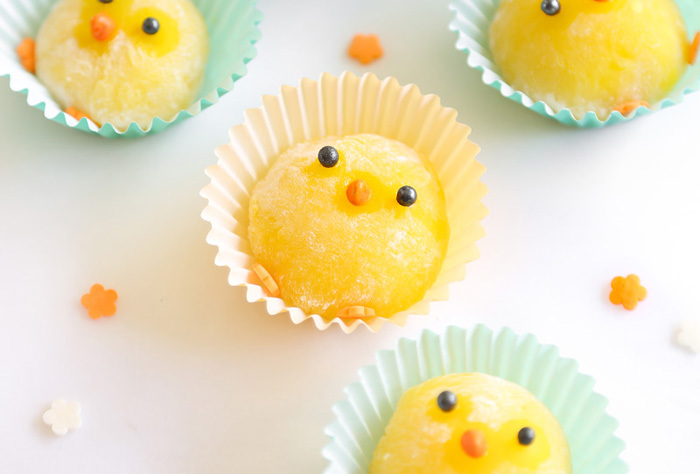 Now that I know mochi can be made using the microwave, I might have to try my hand at it! OMG my grandson is going to love these! I just want to let you know how much I look forward to your posts. I got both your books for Christmas from my husband. I am really enjoying them. Hope you write more. Your goodies rock girl! Omg those are so freaking cute, I WOULDNT BE ABLE TO EAT THEM! LOL. Awesome job! Sooo cute! you just want to adopt them instead of eating them! Queen of cuteness you are, Heather! These are adorable!! 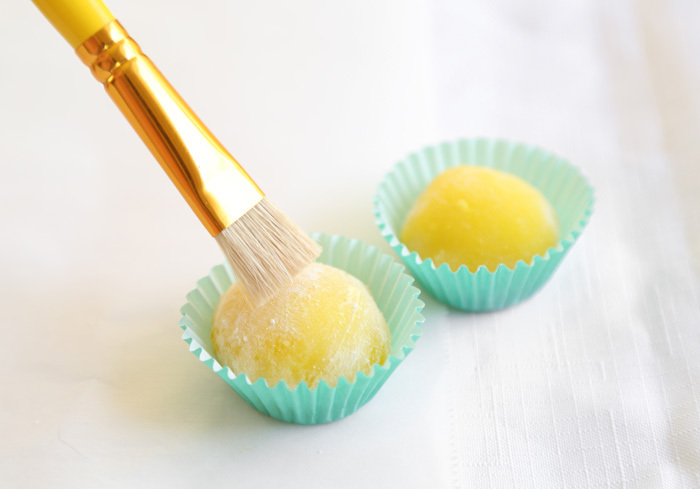 Here's a hint for cutting mochi - use a plastic knife (yes, the cheap disposable stuff). I'm not sure why, but the mochi doesn't stick at all to the plastic so it cuts beautifully. These are precious!! Would love to try making mochi. I've actually never heard of it. Going to check out your treats on HGTV. VERY cool! Coloring Book Cookies for The Etsy Blog! Candy Terrariums for the Etsy Blog!